Speed it up. Depending on your weight, you can burn about 65 to 100 calories for each mile you walk. If you move faster, you’ll burn more calories covering the same distance. Vary the pace. Studies also show that interval training is an effective way to burn more calories. 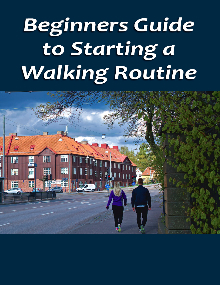 Alternate between periods of walking briskly and strolling at a more moderate pace. Check your posture. To move efficiently and avoid injuries, ensure you’re using proper form. It’s usually safer to take more steps rather than trying to lengthen your stride. Check that your heels hit the ground first, and use your toes to push you forward. Engage your core muscles to take pressure off your back. Use your arms. Swinging your arms will also increase the intensity. If you want to add props, try walking poles or hand weights. Go backwards. For an extra challenge try walking backwards in a safe area. Climbing up hills is another constructive option. Hit the beach. Just changing surface can power up your workout. Traveling across sand or snow requires more energy than walking on smooth pavement. Listen to music. Playing your favorite tunes can make any workout seem like less effort. Put together a lively soundtrack that will motivate you to keep going. Dress comfortably. You can buy shoes designed specifically for walking or just choose any pair with low heels and firm support. Dressing in protective layers will also help you deal with cold or wet weather. Find a buddy. Walking with others can be fun. Invite family and friends along or join a local hiking group. If you have a dog, you have a companion who would love to join you at the park. Talk with your doctor. Even though walking is a generally safe and low-impact activity, you may want to check with your doctor if you’ve been sedentary for a while. Your physician can help you set goals that are realistic for you. Take the stairs. Skip the elevator and escalators. Climbing up stairs burns almost 2 calories for each 10 steps. Park further away. Walk or bike to work if possible. If the distance is too far or there’s no safe route, you can still choose a parking space that will enable you to squeeze in a brief hike before arriving at the office. Schedule work breaks. Pause every half hour to stretch and move around. You could also make it a habit to use the restrooms and copy machines on the next floor instead of the ones by your desk. Stand and dial. Think about how many minutes you spend talking on the phone each day. You can easily spend a lot more time on your feet if you pace around while you’re checking on your children or reaching out to clients.